“Pound away!” “Whip through!” I think Devo wrote this ad. Well, no wonder the rest of the family has to work so hard at their clearly defined gender roles — Father’s a damned slacker! 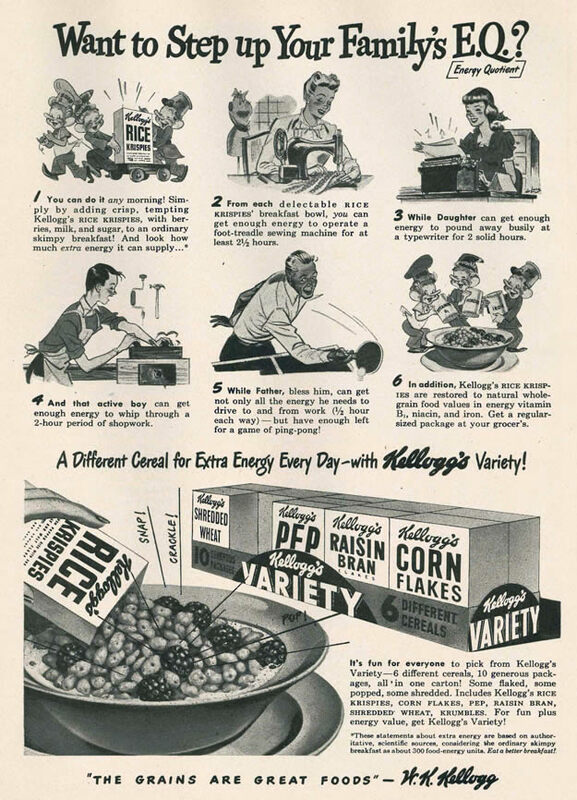 2 From each delectable Rice Krispies’ breakfast bowl, you can get enough energy to operate a foot-treadle sewing machine for at least 2 1/2 hours. 3 While Daughter can get enough energy to pound away busily at a typewriter for 2 solid hours. 4 And that active boy can get enough energy to whip through a 2-hour period of shopwork. 5 While Father, bless him, can get not only all the energy he needs to drive to and from work (1/2 hour each way) — but have enough left for a game of ping-pong! 6 In addition, Kellogg’s Rice Krispies are restored to natural whole-grain food values in energy vitamin B1, niacin, and iron. Get a regular-sized package at your grocer’s. A Different Cereal for Extra Energy Every Day—with Kellogg’s Variety! It’s fun for everyone to pick from Kellogg’s Variety—6 different cereals, 10 generous packages, all in one carton! Some flaked, some popped, some shredded. Includes Kellogg’s Rice Krispies, Corn Flakes, Pep, Raisin Bran, Shredded Wheat, Krumbles. For fun plus energy value, get Kellogg’s Variety! *These statements about extra energy are based on authoritative, scientific sources, considering the ordinary skimpy breakfast as about 300 food-energy units. Eat a better breakfast! This entry was posted in ads of yore and tagged ads, advertisements, advertising, breakfast, breakfast cereal, food, kellogg, kellogg's, magazine ads, print ads, rice krispies, vintage, vintage ads, vintage advertisements, vintage advertising on January 21, 2017 by Clayton Hove.